Annual Fund Update: Things Are Looking Up! Thank you to everyone who stopped by the Annual Fund table at Back To School Night. We received a huge spike in donations after last week. The overall percentage of families participating in the Annual Fund is at 35%. This is great news considering last year only a total 47% of families participated. We have ways to go to reach 100% participation and we are confident we can reach this goal. 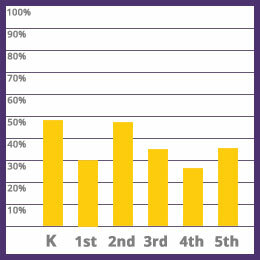 So far, Kindergarten and Second grade are tied at about 50% participation. Way to go! Let’s keep the momentum going!